Industrial electrical services consist of upgrading electrical equipment, retrofitting electrical equipment or even electrical services for new constructions. Retrofit the industrial lighting system to save energy and money while retrofitting your production line ensure the most efficiency for your operation. Remember to contact Butterfield Electric if you are moving or relocating to another facility whether you stay in Bolingbrook or move out of Bolingbrook. Low voltage systems Low voltage systems in Bolingbrook are vital to many businesses who need CCTV, fiber optics, or networking systems. We focus on delivering low voltage turn key applications in order to make your project work efficiently and effectively. Medium voltage systems in Bolingbrook ranges from 600 volts to 34,000 volts ensuring the safety and energy efficiency of every project. These project include transformers, backup generators, process control, conduit installations and more. Installing lighting systems, maintaining lighting systems and upgrading lighting systems are completed everyday by Butterfield Electric in Bolingbrook. Our job is to ensure the most effective and efficient exterior lighting systems as well as interior lighting systems utilizing LED, incandescent or fluorescent systems. All of our projects in warehouses, distribution centers and manufacturing facilities have included dimming and lighting controls, specialty retail lighting and even parking garages ensuring safety and efficiency all at the same time. 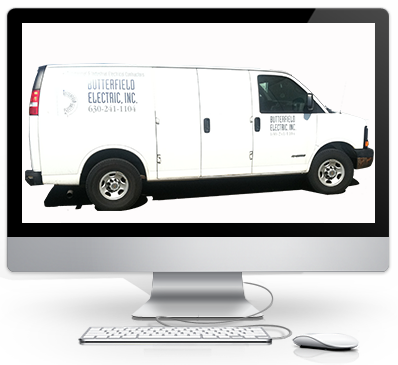 As an electrical contractor, Butterfield Electric has a specific division dedicated to companies needing electrical work done on their material handling solutions. Companies in Bolingbrook come to us specifically for our concept work, design ideas, engineering thoroughness and specification development. All of our electricians are experienced with conveyors, robotic systems and shipping systems alike. A Bolingbrook UL508A certified control panel design and fabrication specialist, Butterfield Electric has extensive experience as a mechanical and electrical system contractor. We know what it takes to make your production lines run flawlessly. We design, fabricate control panels along with PCL programming, a specialty few electrical contractors have. Industrial equipment needs installation and repair. That’s where electrical contractor, Butterfield Electric comes in. We take are of industrial equipment such as motor controls, industrial freezers and refrigeration, air compressors and industrial ovens to name a few. You can find our electrical contracting services in various industries including food, beverage, manufacturing, electronics, chemical and more.